Magda Stoczkiewicz is the director of Friends of the Earth Europe. Jan Willem Gourdiaan is General Secretary at the European Federation of Public Services Unions (EPSU). Last month new figures revealed that 8 men own as much wealth as the poorest 3.5 billion inhabitants of this planet. In the same week it was confirmed that 2016 broke another record for global average temperatures – joining the alarming trend that 16 out of the 17 hottest years have been recorded since 2000. Such extreme inequalities and concentrations of wealth, alongside unacceptable poverty levels and the over-exploitation of people and natural resources, call for us to step up international cooperation and solidarity to overcome these global crises. These crises are tangible evidence that the current corporate-led globalisation, and the trade agreements that shape and accelerate it, is not working for most people or the planet. But this week the European Parliament might approve yet another of these trade deals, the EU-Canada Comprehensive Economic and Trade Agreement (CETA). The deal has been touted as the “best and most progressive trade agreement the EU has ever negotiated” and is supposed to be “setting a high standard for free, fair and sustainable trade”. Yet, a closer look at the deal reveals the opposite. 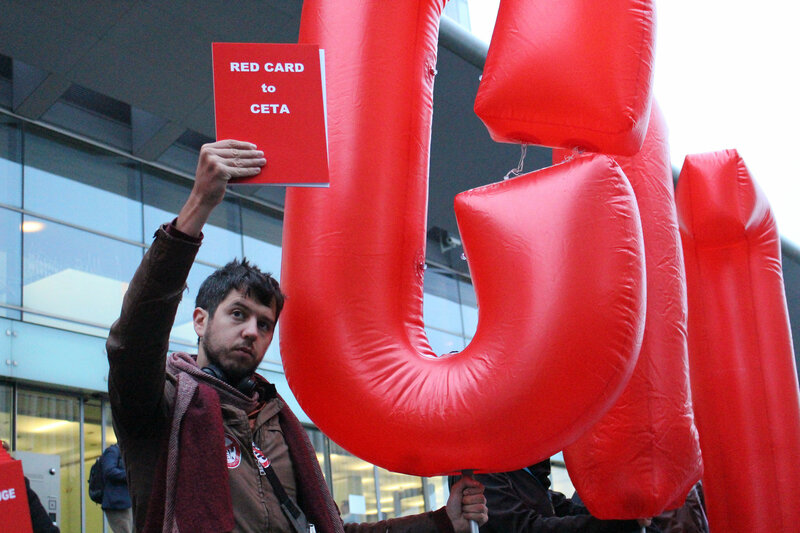 CETA affords foreign investors with far-reaching, highly enforceable rights that allow them to claims millions or even billions from governments if they introduce social, health or environmental measures that affect companies’ profits. While Investors get VIP rights – without any obligations – citizens, consumers and workers are left in the cold with weak and unenforceable commitments on labour, consumer and environmental issues. Moreover, as the European Parliament’s employment committee stated, CETA threatens to destroy jobs while increasing inequality and putting public services at risk. If this is what is meant to be fair and sustainable trade, it goes exactly in the wrong direction. In Europe, discontent about new corporate-led trade deals has been voiced on an unprecedented scale. Workers and those on low incomes do not see the benefits of these deals, and nor do many municipalities, farmers, consumer and environmental groups or small businesses. A record-breaking 3.5 million EU citizens called for trade justice and a fairer trade system. Hundreds of thousands have taken these demands to the streets, while overwhelmingly supporting international cooperation and cosmopolitanism. Yet, instead of addressing criticism of current trade deals, proponents of CETA try to sell the agreement by making disingenuous claims that have little to do with trade. CETA, they say, needs to be passed to show that the EU is capable of making trade agreements at all – as if this was a good argument for passing a bad deal. By trying to confuse the issue and ignoring well-founded concerns, they are only contributing to an image of an “out-of-touch” elite. This plays straight into the hands of the right-wing populists who are trying to jump on the bandwagon of public discontent. Unsurprisingly, their promises and the policies already enacted, as we can witness in the United States, are poised to worsen inequality, harm the environment and attack workers’ rights. Voting in favour of CETA will not make the public discontent go away, it will only strengthen it. CETA is not a good trade agreement: it won’t provide for the much-need orientation towards fair and sustainable development based on democracy and shared values. That’s why we need to reset European trade policy. This reset needs to put trade policy back into its place: maximising trade and giving super-rights for investors must not be the aim any longer. Instead trade policy should be a tool that serves widely-shared and agreed objectives such as reducing inequality, contributing to good and secure jobs, ending tax evasion and supporting efforts to reduce greenhouse gas emissions and other environmental harms. There are many interesting proposals about how to shape a new, progressive trade agenda, and it is time to put these on the table. They include ideas on how trade agreements can contribute to protecting workers’ rights or fighting climate change. The European Parliament has the unique chance to send a powerful signal that “trade as usual” cannot continue by rejecting CETA this Wednesday (15 February) – it must not let this chance go to waste.